Combine sour cream, mayonnaise and seasoning in a small bowl to make veggie dip. Stir together until smooth. Set aside in fridge. Whisk oil and mayonnaise together in a medium size bowl. Toss chicken filets into bowl and stir to completely coat. Combine corn flake crumbs and spice, on a large sheet of wax paper. Line a cookie sheet with sides, with parchment paper. Press each piece of chicken into crumbs to completely coat, then arrange on cookie sheet lined with parchment. Place in preheated oven. Set timer for 12 minutes. Rinse baby carrots and tomatoes. Rinse cauliflower and break apart into small florets. Rinse and slice cucumber. Arrange veggies on plate. When timer rings chicken is ready. 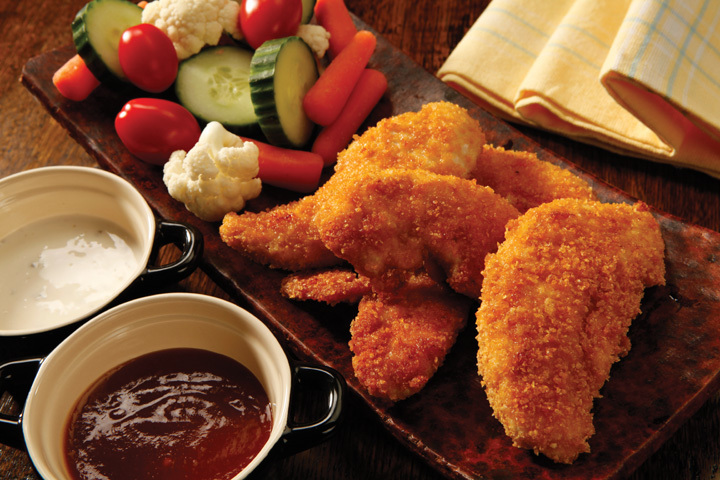 My family likes dipping our chicken fingers in plum sauce or honey. Just looking for your Part 5 of your 5 part series regarding the eat clean system. Watched the initial information on cityline.